“I wish my threshold of self-deception was as low as yours.” That line, a stinging rebuke, directed at Aydin (Haluk Bilgner), the hotelier, retired actor and landowner, by his sister Necla (Demet Akbag), during an increasingly intense (and lengthy) slanging match, in Nuri Bilge Ceylan’s, Winter Sleep, winner of 2014 Palme d’Or, is one of many aimed in the fella’s direction. In fact, any comment or insult is likely to stick. Aydin is a smug bourgeoisie hiding behind the mask of an artist; a bloke emotionally crippled by arrogance, self-regard and a cynical view of the world. One can’t help but ponder what sort of surrealist mishap or violent demise would befall him, had this been a Luis Buñuel film. Pier Paolo Pasolini might have fed Aydin to the pigs, or cursed the guy to wander the slopes of Mount Etna, for all eternity. Is it not a curious psychological condition that blights certain folk; especially, those with the succour of a trust fund, or inherited wealth? The fraud of benevolence, feigned (read: self-serving) disinterest, and yet setting the world to rights as a cultural critic. Such haughty, aloof attitudes can drive people mad. The wife and sister, who live with Aydin in the Hotel Othello, a place he inherited upon the father’s death, understand his hypocrisy just fine. Over the course of a languidly paced but riveting three-hours-and-sixteen-minutes, Winter Sleep boasts the thematic and investigative depth of a doorstop novel, as Aydin is openly confronted, not by personal demons exactly, but his many flaws. 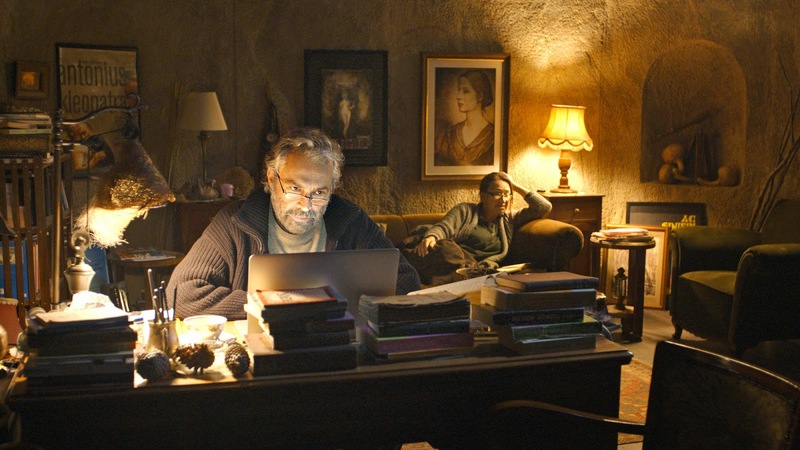 Winter Sleep is also the depiction of emotional estrangement. Aydin feels the burden of various responsibilities, and resents them. He is husband to a much younger wife, Nihal (Melisa Sözen), and worries her campaigning will cause social embarrassment. He is a man forced to look after his depressed sister, and plays landlord to tenants he cares little for. Aydin does have the capacity for self-awareness, but conceals it for moments of beneficial reconciliation and reflection. For, even when he acknowledges that he’s far from perfect, there is a whiff of play-acting. ‘Since you’re an actor, you forgot about being real,’ the sister notes, during the earlier encounter, which grows from a quiet conversation to a storm of recriminations, and is placed in the film as the first open revolt against the king of the castle. As with any pseudo self-made man who has risen in the world, Aydin finds the time to lecture Nihal, who spends her days attempting to launch reformist campaigns, about what it’s like to grow up in a rural backwater with few amenities and privileges. Yet he appears to think very little of those that cannot achieve the same. It’s classic passive-aggressive thinking. The conservative man hiding in a liberal disguise is like the wolf in sheep’s clothing. He berates a person’s poverty as a fault of their own making. In one electrifying scene, Nihal tries to make a charity donation – really undertaken to get back at her annoying husband – but is met with the staunchest defiance/resistance by a local tenant, who refuses the offer in magnificent style. For the lady of the manor has failed to understand one vital thing: a man’s pride. That pride has been battered and belittled, but Ismail’s unequivocal response serves as an important lesson to Nihal and her ideals of community patronage. In the final portion of the film, snow blankets the Cappadocian village, replacing windswept chills with a new level of frostiness. The landscape may perhaps symbolically reiterate the notion that Winter Sleep is dedicated to revealing just how easily a person can close off their heart. 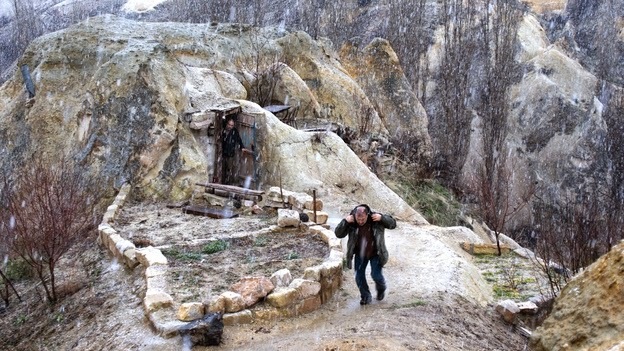 Ceylan has produced a sublime and exquisitely crafted motion picture. The final three shots are quietly despairing: Nihal all alone in her room/cell; Aydin sat hunched at his desk typing out the title of his book on the history of Turkish theatre; the Hotel Othello in thick snow, the place obscured in a blinding white nothingness. The cut to black is akin to the sealing of a tomb.